Structural models in Enterprise Architect, especially Class models, are frequently used to define the meta-model of some domain of interest. For example a meta-model can be defined using a Class model to rigidly define the objects, data, relationships and types that make up the domain of Geospatial information. Likewise models can be (and are) built to describe domains such as Water management, Health, Retail, Insurance, Car registration, Entertainment and many more. These models are extremely valuable and frequently represent a significant investment in time and money by either commercial or standards based organizations. An important part of realizing the benefit of these models, in particular where information must be exchanged between multiple parties, is in the definition of schema (often XSD based) that codify how a message should be formed to be conformant to the underlying meta-model. Traditionally, such message schema are written by hand, based on the meta-model. This is generally a laborious and error prone exercise. Enterprise Architect has a long history of being associated with the development of both commercial and standards based meta-models, and there are many examples of models defined in Enterprise Architect model files that are used to specify the exact construction of an information domain of interest. 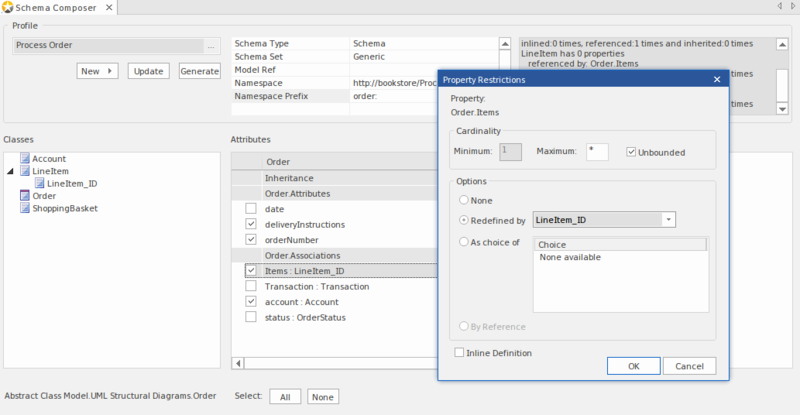 The Schema Composer in Enterprise Architect has been built to take maximum advantage of models stored in an Enterprise Architect model file or repository (or Cloud based server) by streamlining the conversion of model information into schemas that comply with the naming standards and format of a variety of popular industry meta-models. This approach drastically reduces the time taken to form a valid schema and eliminates human error in transcribing model information into schema text. In addition to the new Schema Composer, Enterprise Architect also supports the modeling of XSD and WSDL definitions using UML Profiles that support explicit modeling of the relevant types. This is sometimes necessary when building a complex XSD or WSDL from scratch and needing to have a fully worked out visual model of the final schema. Note that as Enterprise Architect also supports the import of XSD documents, it is possible to produce a schema using the Schema Composer, and then for documentation and visualization purposes (or even for further customization), import that schema back into either the current or a different model. Additional topics included in the Schema Engineering section are devoted to MOF (the Meta Object Facility), ODM and NIEM. The section on NIEM is quite extensive as Enterprise Architect includes many features necessary to model and work with NIEM domains and schema. As with some of the other technologies, there is in addition a downloadable version of the NIEM core as an Enterprise Architect model.